There are few things more satisfying than sharing a skill or talent with people you really like. It's also true that teaching someone so they can acquire the skill and exercise their own talent is better than just doing your thing for them. Last week I had the fun of sharing my baking skills with some women friends and showing them how to make some springtime breads. Because for yeast breads it is sometimes easier to start with the dough already made, I showed them how to work a little magic on plain, ordinary frozen bread dough from the supermarket. I used Bridgeford brand and so I had three one-pound parcels of dough. I thawed them out overnight which worked very well. 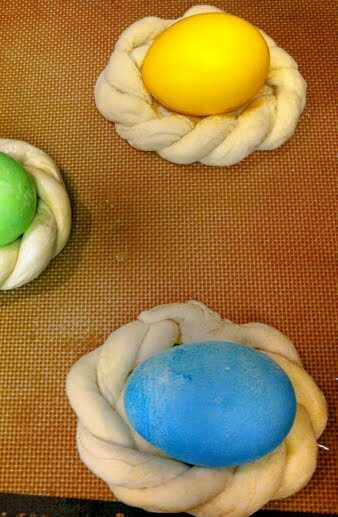 The first recipe was perfect for Easter morning (if you make it the night before as I did) because you end up with totally cute nests surrounding a colored egg which cooks while the bread bakes. This time the egg was barely hard boiled. The last time I made thee the eggs were soft boiled on the way to hard boiled, so there was some runny yolk but no runny whites. It all depends on how long you bake the bread. This time I used plain white bread dough and then sprinkled sesame seeds on the nests before baking. That worked better than the sweet dough I used in THIS post in the spring of 2009 in the Bread Baker's Dog blog. 1) Egg nests: When I made this a few years ago the eggs came out of the oven soft boiled and you should remove the dyed egg from the nest within the first 10 minutes after you serve them because otherwise the shell tends to stick to the dough a bit. I dyed the uncooked eggs the day before, created the nests, then put it all in the fridge overnight, baking them in the morning. Use the illustrations from THIS post if you want to see how to put them together. Divide dough into 15 equal portions, about 1 oz each. Set three (3) portions aside. Cover half of the remaining twelve(12) portions with plastic wrap (six portions), but leave on the counter. You can unwrap them when you've made the first 3 nests from the six (6) portions you will now work with. Take a portion. Roll it into a rope about 12 inches long. Repeat with another portion. Twist the ropes together. I find that if you start in the middle, twist one side to the end, then twist the other side to the end, it works very well. Form the twisted rope into an oval and trim off any excess and make a continuous twist rope oval. Take one of the three portions that were set aside and divide it into 2. Take one of those pieces and form an oval…you can add any dough you trimmed off, too. 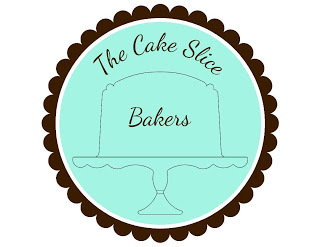 Place the oval on a Silpat mat, parchment lined baking sheet, or greased baking sheet. Place one of the uncooked eggs in the middle. Put the rope oval in the palm of your hand, turn it over and lightly pat it with a wet hand.I also patted the inside rim of the rope. 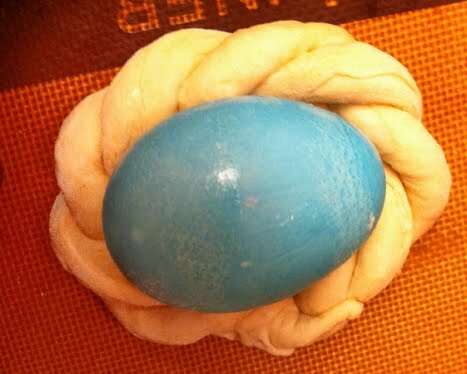 Set the rope oval over the egg and let the wet dough seal with the flat oval already on the pan. Repeat with the rest of the dough. You should finish with 6 nests. NOTE: I used uncooked eggs and dyed them in a water bath that had been made from about 6 drops food coloring, 1 tablespoon cider vinegar, and boiling water. The eggs should be close to room temperature so they don’t get shocked and break when put in boiling water. The eggs dye very quickly and can be removed to a paper towel lined glass baking pan or pie pan to drain and dry. They are in the dye bath only about 5 – 10 seconds. I dyed them right before I rolled out the ropes and then refrigerated the pans of rolls overnight.The photos are from right after I shaped them. I added the seeds the next morning before baking, but forgot to take any photos! They sat out for about 1/2 hour before I baked them. If the house or kitchen were very warm, you could probably pre-heat the oven and bake them about 15 minutes after removing from the fridge. If shaping and baking on the same day, cover nests and let rise in a warm, draft-free place 30 – 45 minutes if baking right away, or until nearly doubled. Bake 20 – 25 minutes, or until golden brown. Remove from pan and let cool on racks about 5 minutes then serve while hot. I'm submitting this to fellow Bread Baking Babe Astrid of Paulchen's Food Blog since she is the hostess of the current Bread Baking Day with the theme of bread with eggs - it's #48. You can send her an entry too and I bet you will find a different way to combine eggs and bread dough...maybe with eggs IN the dough? Go to her post HERE to learn all about it. I'm also sending this over to fellow Bread Baking Babe Susan at Wild Yeast for her weekly Yeastspotting event. 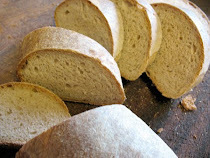 If you ever bake with yeast, do visit Yeastspotting for lots of yummy bread inspiration. This is... wow. I have never seen anything like this before, ever. 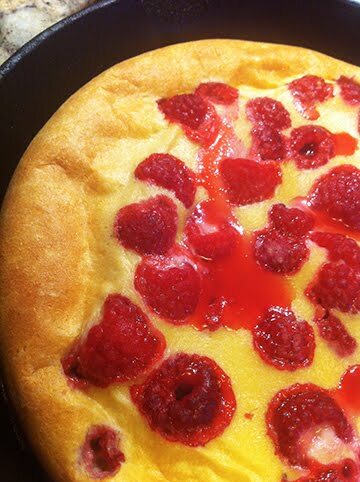 I can't see enjoying it with a sweet bread, no - but with savory, that's breakfast! 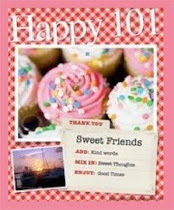 These are great fun to make and to eat. I like the savory bread version especially if the yolk is left runny. 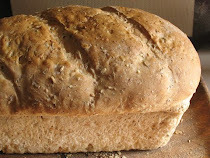 I have seen bread along this lines at our local Portuguese bakery but have never had the nerve to try baking it myself. I always assumed the eggs would get horribly over-done. How nice to hear that they can be any way you like. Elizabeth, they do come out how you like them, but timing can be tricky so you may want to try taking one out at 20 minutes to see if that is cooked enough for you, then time the rest in relation to that one. Warm bread with runny eggs sounds like the perfect Easter brekfast. Exactly how do you dye the eggs in advance, Elle? Do you par-boil them in dye and vinegar? Or do you leave them soaking in the dye overnight in the fridge? Andreas, These are perfect for Easter morning...just be sure to bake them to light golden brown to keep the yolks runny. Elizabeth, These are fun to make. I used uncooked eggs and dyed by dipping them in a water bath that had been made from about 6 drops food coloring, 1 tablespoon cider vinegar, and boiling water, all in a small cup just big enough to hold the egg and dye bath. The eggs should be close to room temperature so they don’t get shocked and break when put in boiling water. The raw eggs dye very quickly (maybe 5-10 seconds)and can be removed to a paper towel lined glass baking pan or pie pan to drain and dry. They are in the dye bath such a short time that they are still raw when you work with them making the nests, so handle with care. I dyed them right before I rolled out the ropes and then refrigerated the pans of rolls overnight.The photos are from right after I shaped them.You can let the shaped nests rise and bake them right away once risen, or let them sit overnight in the fridge like I did. Thank you for spelling that out, Elle. Am I correct that 20-25 minutes of baking at 350F renders the eggs "soft boiled" (as in white nicely set but yolk runny)? I'm trying to figure out a way to make two nests - one with a "hard-boiled" egg for me and one with a "soft-boiled" egg for my husband. I'm guessing that if I par-boil one of the eggs for 5 minutes before putting it on the nest, that might do the trick. Elizabeth, I love your solution to figuring out which egg will be runny and which not. Unfortunately not all ovens are alike (my oven is so old that it is too cool at first, even when preheated, and too hot later (as compared with the temperature setting on the oven knob) so it is hard to tell how long will yield runny yolks. I suspect that if you make the nests and let them rise, then bake one until a very light golden brown and the other a deep golden brown that you will have the desired results. The par-boiling idea worries me because the egg will cool again during the nest rising but will not have cooked enough to prevent bacteria from growing in the warmed egg. The quick dip to color them doesn't do that if the eggs are right from the fridge to the color bath. I'd try the different coloration of the bread due to different baking times first. Hope you have a Happy Easter and that your husband loves the egg nests!